Smoky and spicy flavors mingle in these Chipotle Sheet Pan Chicken Fajitas! Tossed with chipotle fajitas veggies like colorful bell peppers and red onion, this dish takes a traditional favorite to a whole new level of awesome. 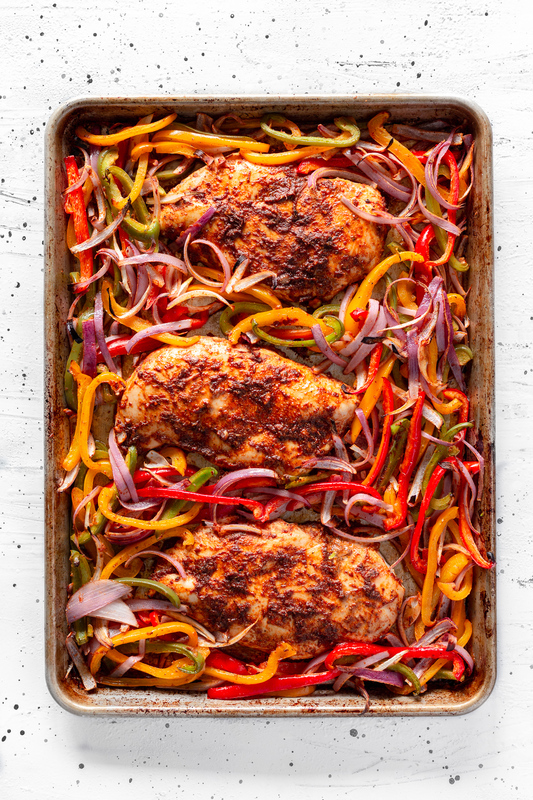 Ready in 30 minutes, these sheet pan fajitas feature a super simple chipotle chicken recipe with a marinade that whips up in a food processor or blender in seconds! 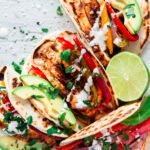 Serve these fajita tacos family-style and dig in with all your favorite fixins, like sour cream, avocado, and fresh lime juice. Flavor never tasted so damn good. I love the ease of chicken fajitas. Just some simple sliced veggies, chicken, tortillas and voila! An amazing Mexican dinner is served! To take this simple dinner to new heights, I decided to try it sheet pan-style, but with a twist: chipotle! 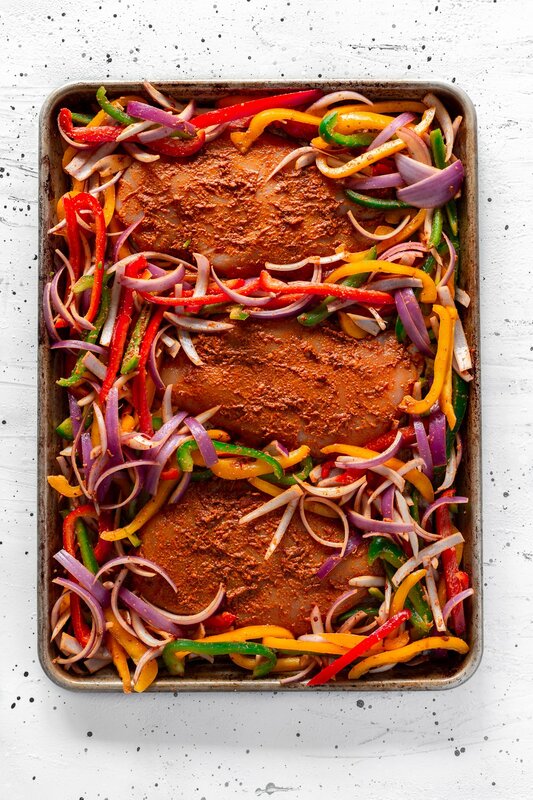 Why have regular sheet pan fajitas when you can have smoky, spicy, chipotle sheet pan chicken fajitas?! It seems like a no-brainer, really! 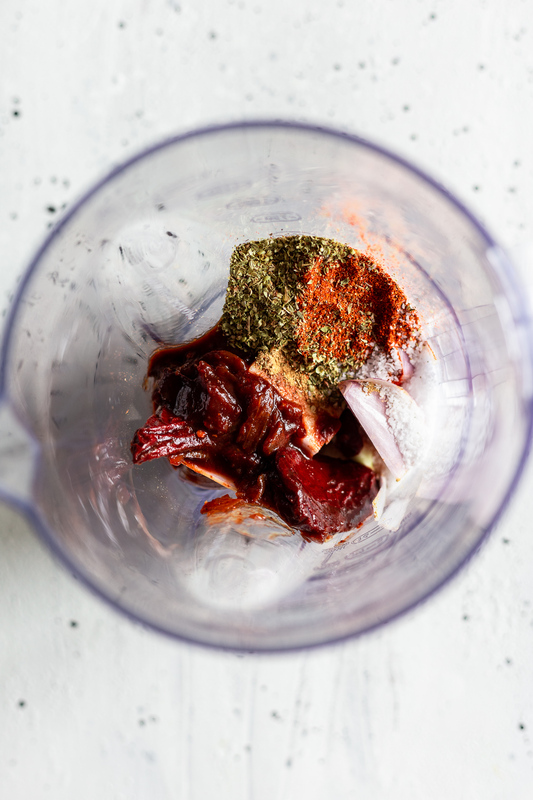 You can blend it all in a food processor or high-powered blender, until it’s a nice paste without any large chunks. If you’re scared of the spiciness, start with a single chipotle pepper, or just the sauce alone. It’s easier to add more than it is to take out! Using the chipotle marinade, portion some aside just for the veggies, around two tablespoons or so. Toss a variety of colorful bell pepper and red onion in the marinade and that’s it! You definitely don’t want to go overboard with the marinade on the veggies, as their natural flavor should still stand out, and the chipotle chicken recipe includes a heavy layer of the marinade for maximum flavor explosion! Are Chicken Fajitas Gluten Free? This recipe is! There are a few things to note though, in order to be 100% sure you’re gluten-free. I personally prefer flour tortillas with this recipe because of the spice level, but seriously, you can use whatever you want! Get ready to dive into a dinner to remember! Tossed with chipotle fajitas veggies like colorful bell peppers and red onion, these sheet pan fajitas take a traditional favorite to a whole new level of flavor. Ready in 30 minutes, serve these fajita tacos family-style don’t forget the fixins! If you like this recipe, please give it a 5-star rating. 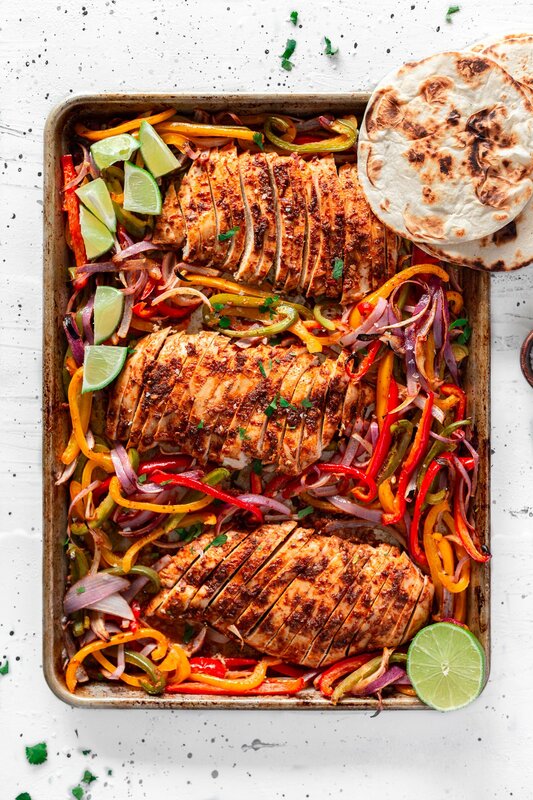 Smoky and spicy, these chipotle sheet pan chicken fajitas come together in just 30 minutes! Roasted with chipotle fajita veggies, top these tacos with avocado, sour cream, and fresh lime juice. Dinner is served! 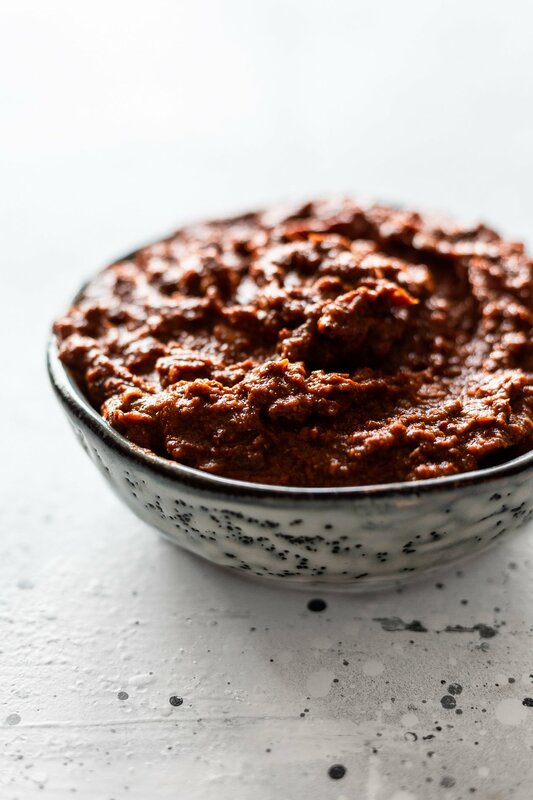 In a food processor or high-powered blender, add all the chipotle marinade ingredients and whiz until no large lumps remain. Spoon into a dish and set aside. Preheat oven to 375 degrees, Lightly grease a sheet pan and set aside. Place chicken breast between 2 sheets of plastic wrap and pound to an even thickness of about 1/2 inch. Slather each breast with about 1-2 tablespoons of chipotle marinade, then set on the sheet pan. Add sliced bell pepper and onion to a large bowl, then add 2 tablespoons of chipotle marinade. Gently toss with tongs until all the veggies are lightly coated in sauce, then turn bowl out onto the sheet pan, fitting the veggies around and between each chicken breast. Bake for 20 minutes, or until a meat thermometer registers 165 degrees. Serve with warmed tortillas and a squeeze of lime juice. Nutrition info includes the use of ALL the marinade, and corn tortillas. I love how quick and easy this recipe is! So good! Boy, these fajitas are amazing! I never marinated my chicken in the past, just seasoned, and the flavor wasn't impressive! Thanks for the wonderful recipe!